Match 58, to fight for the top place, RCB took on KKR, Stand in captain Virat Kohli won the toss and decided to field first, KKR got off to a poor start by losing top three with score being just 30, it would have be disaster if Pathan was held when he was in 7. It went down and he took charge and started hitting the skies, but even before the ball came, rain came down and match was curtailed to 13 over per side. Which left KKR 89/4 in 13 overs, and corrected score was 102 to win in 13 overs. As usual another Gayle’s Knock which made things easier for RCB, 38 from 12 balls ended the match in the 3rd over and RCB just played the fiddle out to win the game by 4 wickets and 3 balls to spare. 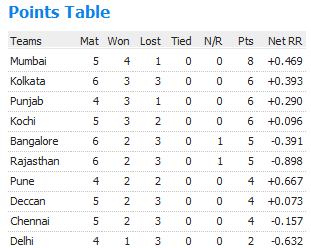 Match 59, Another chance for Mumbai Indians to go up the table, with listless Deccan’s take them in Wankade Stadium. As Sangakarra won the toss and decided to Bat first, but got to a hopeless start as Michael Lumb lost his stumps to yet another Malinga’s spl. Apart from last over heroics from Amit Mishra, Deccan’s batting looked so much in ordinary, Spectacular last over got Deccan’s to 135/6 in 20 overs. Out of 10 times, Mumbai would have taken this score all the 10 times, It wasn’t the case, as wickets kept on falling for Mumbai and they went on for their consecutive batting failure, Top order failed miserably, with Sachin just scoring 37 off 42 balls. Later in the game, Pollard tried with few lusty hits, but its too much for him. Bottom tabled Deccan’s pulled a stunning victory over the favourites with 10 runs. 1. Rajasthan Royals, 2.Kochi Tuskers Kerala and 3.Kings XI Punjab. – With the six over long on, Gayle became the highest run scorer of this tournament overtaking Shewag. For all guys out there he did this in just 7 matches. 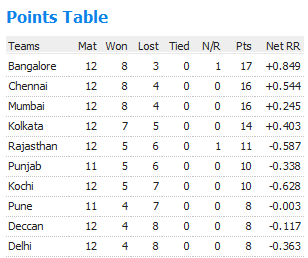 – 7 Matches winning streak is the highest by any team in IPL, Mumbai had the previous best of 6 wins consecutively. – Out of 120 balls, Mumbai Indians played 60 dot balls, which is the highest ever by any team for this tournament. – Bangalore won the match with 3 balls to spare, which has happened 4th time in this tournament. – 3 players went past 400 runs today, Gayle, Kohli and Sachin Tendulkar in the respective order. – With 9 catches Kieron Pollard is now tied with Kallis and Shewag for the hghest no.of catches taken in the tournament. – Out of 7 matches Gayle played, He won Man of the match in four occasions. – Amit Mishra scored 18 runs of 6 balls and he gave 18 runs in 4 overs and picked up 1 wicket, he did neutralise his runs. Its another day, Two high voltage performance sunk the opposition to dead. First of it was Chris Gayle, Man some kind of power this man has and he tonked the KKR out of the park in no time, chasing 171 with 11 balls to spare, and scoring a magnificent century. Which paved the way for RCB to register a 9 wickets win in ease Vs KKR. Later in the day, Rohit sharma inspired by him almost got to an hundred before falling to a aussie bad omen number 87, another one was Harbhajan who turned round the game woth a 5 wicket haul. CSK had bundled their sorts with Bhaji singing bangara, Finally Mumbai won the match by 8 runs. – Chris Gayle’s 5th six of his innings went for 104 meters which is the highest ever for this season, next ones are 101 by Gayle himself and 99 by valhathy. – 171/5 is the highest score recorded by KKR this season. – Gayle hit the 200th six and 650th boundary of IPL 4. – Chris Gayle scored the Maiden Century and 3rd Century of this season and overall 15th century in IPL so far. – Chris Gayle 102* is also his personal best bettering 88 when he was with KKR. – 7 sixes in an innings by Chris Gayle is the highest ever. – Albie Morkel bowled the first first over maiden and sixth Maiden overall in this season of IPL. – This is third time RCB has chased down a down target with 9 wickets to spare in IPL. – 71* is the best score for Badrinat, his 2nd fifty in IPL 4 and overall 8th in IPL career. – 87 by Rohit Sharma is also his personal highest, bettering 76* scored when he was with Deccan Chargers. – Harbhajan picked up the maiden 5 wicket haul, other than Malinga he is another to pickup 5 wicket haul by a Mumbai Indian. Beautiful day of low scoring thrillers. Its two teams down under in action. As expected its a very close and an exciting game. Chasing 140 to win with 7 runs per over. Bangalore came back from the Uthappa’s Opening effect, this time goswami placed a fine knock and hope he retains the position. Opening partnership of 69 was the first for bangalore 5o and above partnership of this season. then kept thmeselves at tha hunt, even though wickets fell at the other end. But boucher holds the nerves and scored needed 10 runs of the very last over. May be i shud say, chris gayle was a bad choice to bowl out the last over. Fabulous game went till the wire and pendulum was swinging in both ways for every over. KXIP started off bit slow i shud say, lost goel early in the innings then bopara and finally skipper yuvi before the break, which ensured , they made just 50 runs in their first 10 overs, really i shud say it didnt click well for punjab guys. pitch was pretty slow and ball stops a bit before coming into the bat, so batsman ended scooping the ball in the air many a times. No partnerships and anyone to with hold the innings with Kumar sangakarra, who had a lone vigil in the crease till the end, making an unbeaten 45 runs. and bowlers for Mumbai did really well esp: slinger malinga claimed the figures of 4-0-12-2, and rest others also chipped in. Just needing 120 runs to win, evry1 felt, its a sitter for them with the subliminal form of Sanath and sachin from the last match, it all just counted in times, but no mumbaikar wud have beleived the score after 4.1 overs, its 12/3 and both sanath and sachin back to dressing room. the start which KXIP wud dreamt off.. and they lost the track all of a sudden bravo played a poor shot to get himself out, Abishek nayar sticked a bit with JP duminy to steer ship back to position, but no one cud say, that someone gained advantage at any point, it was swinging again and again. Finally its all abt 2 inchs shot for JP duminy taking mumbai to a home of victory, Abdulla bowled a very good last over, just conceding 8 runs and claiming the wicket of JP duminy. in the nail bitting match its KXIP who won by 3 runs in the end. – Malinga is the leading wicket taker and he is the only player who has the record of bowling all full quto of his 4 overs and keeping his economy below 6. His stunning figues are 3/15 , 3/19, 3/11 and 2/12. which add up to 57 runs in 16 overs and gaining 11 wickets. – KXIP defended the lowest ever total of IPL season against MI. – Its ninth time a batsman is out after strategic time out, this time the unlucky guy is Jayawardene. – MI scored 47/4 in the first 10 overs, which is also the lowest ever score made in first 10 overs. – Beleive it or not Team topping in the total no of booundaries scored is Royal challengers bangalore with 77 Boundries (in 6 games) of the season till now, and followed by CSk with 55 fours. – MN van Wyk of KKR took four catches against RBC which becomes the best performance by a KKR wicket keeper. – Least boundary hit by a team in full 20 overs is KXIP, against MI, they got just four 4s and 2 sixes. Hell lot of fatcs…. Hmm… i am enjoying it… Hope to update everyday as i do…. see u 2maro with CSK and RR clasing for the points table battle.